There is an expanse of land facing the mighty Pacific Ocean that reveals itself as you journey past the Cliff House Restaurant along the Great Highway in San Francisco. Observing the area directly across from Ocean Beach that surrounds the rusty old Safeway and soulless condominiums, one gets the impression that there must be more of a history to this curious segment of the city. In 2005, I moved to an apartment on 36th Avenue at Balboa, almost a mile from Great Highway in the outer Richmond District. The Richmond and Sunset Districts, which surround Golden Gate Park, have always had a separate feel from the rest of the city. As the area became my home, I discovered it was just another face of San Francisco, with its own compelling history and fascinating places to examine. 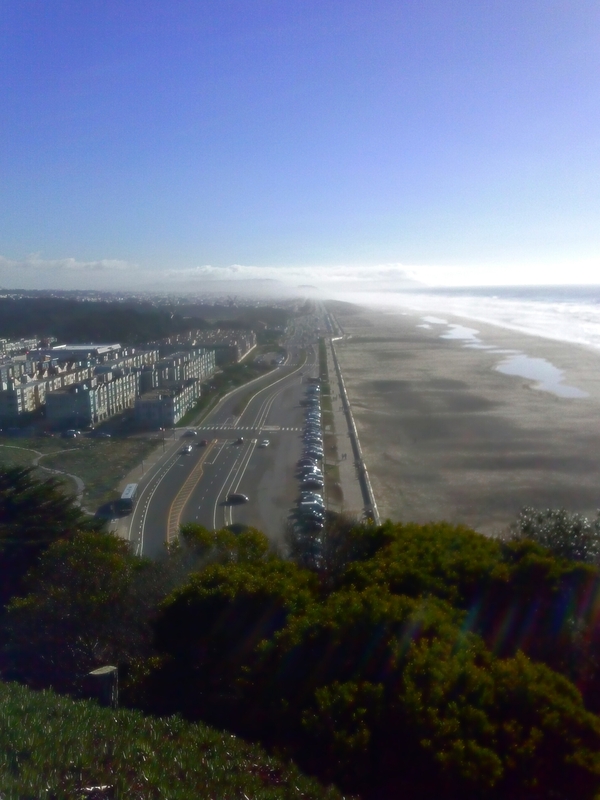 I had been exploring the ruins of the Sutro Baths and Sutro Heights Park for years, and was aware of an amusement park that once thrived across from Ocean Beach. Playland at the Beach, which had been dubbed the “Coney Island of the West Coast,” certainly didn’t start out that way. 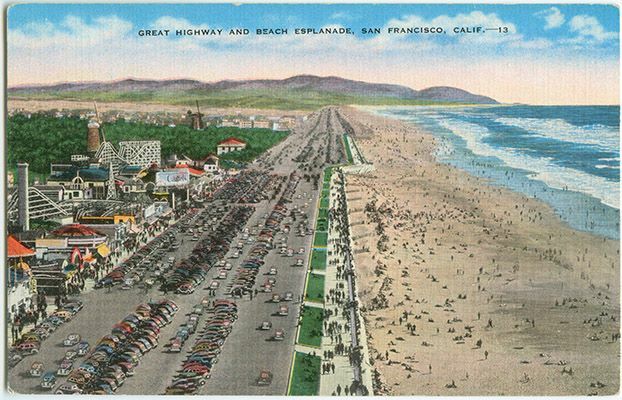 In 1884, a steam railroad was constructed to make Ocean Beach easily accessible as a recreation spot. 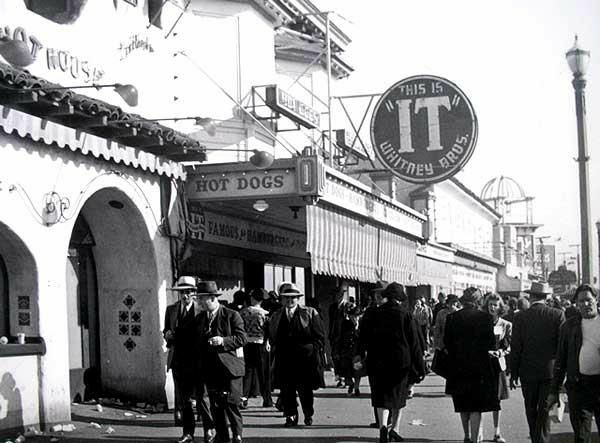 In 1913, Arthur Looff and John Friedle established Concessions on the Beach, with shooting galleries and carnival games. This was an expansion of the existing Hippodrome, which was a building that contained a carousel that was built by Looff and his family. Looff and Friedle became partners, and by 1921 they had acquired several rides and attractions. They renamed the area Chutes at the Beach after one of the rides, the Shoot-The-Chutes. They were open from noon to midnight, every day. The wives of Friedle and Looff never got along, and by 1923 they were quarreling more than ever. Due to the open hostility between their families, John Friedle decided the only remedy to the situation was to buy Looff out of his share of Chutes at the Beach. In order to avoid infighting within his own family, Friedle saw the need to hire an outside party to oversee operations at Chutes. Enter George Whitney. 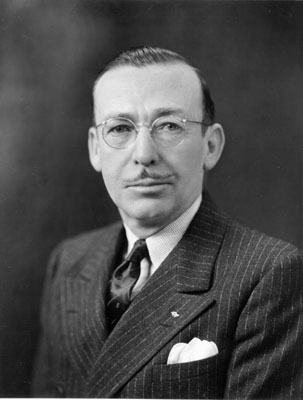 In 1926, George Whitney was made general manager of Playland. Along with his brother Leo, George started to see a bright future for the seaside location, and when the opportunity arose they decided to go in as partners in hopes of owning it all. The Great Depression came at the right time for the Whitneys. Property values waned and America was hesitant to spend money on recreation, creating the perfect opportunity to buy the property on the cheap as it became available. 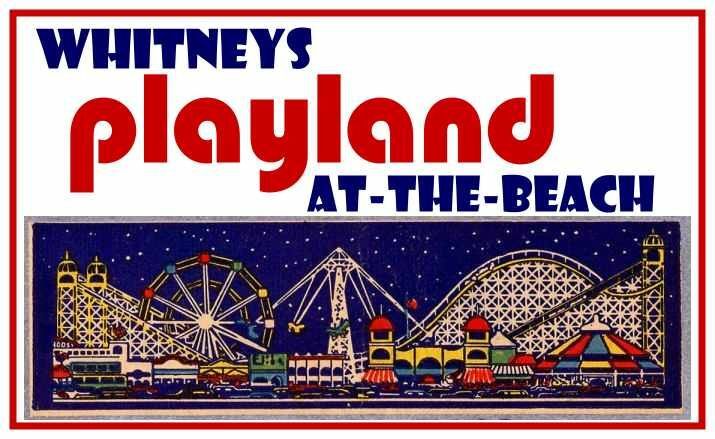 In 1929, George and Leo Whitney purchased many of the attractions and renamed it Playland at the Beach. 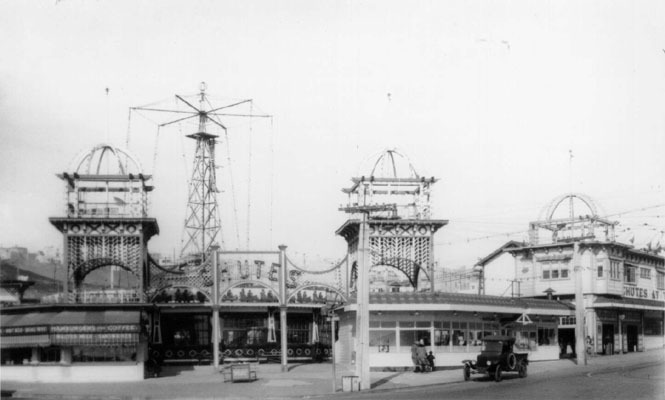 Playland was initially looked at as a diversion for adults, but the Whitneys wanted to make it a fun place for families. 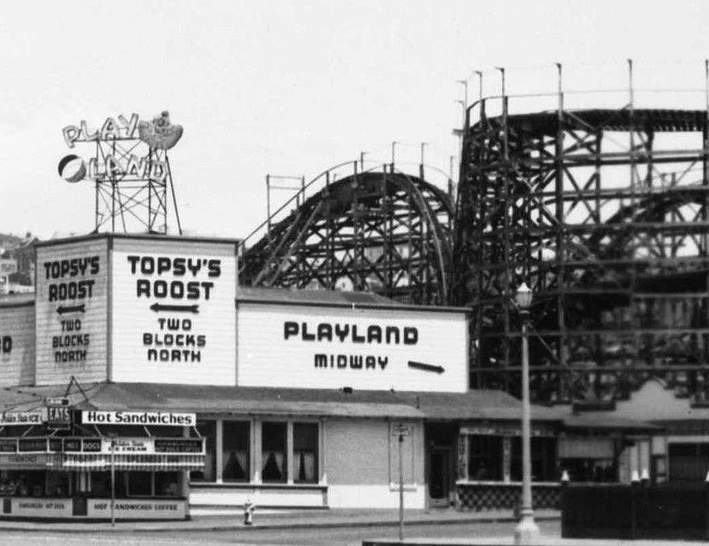 The golden age of Playland followed, boasting 14 rides, 25 concessions, and 4 restaurants. 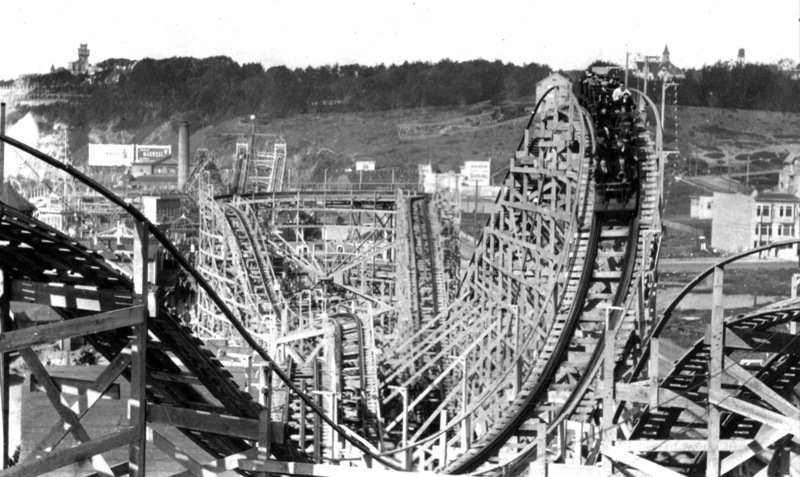 A large wooden roller coaster named the Big Dipper was built, and families from all over the world flocked to San Francisco to see Playland. However, the park had its share of quirks. 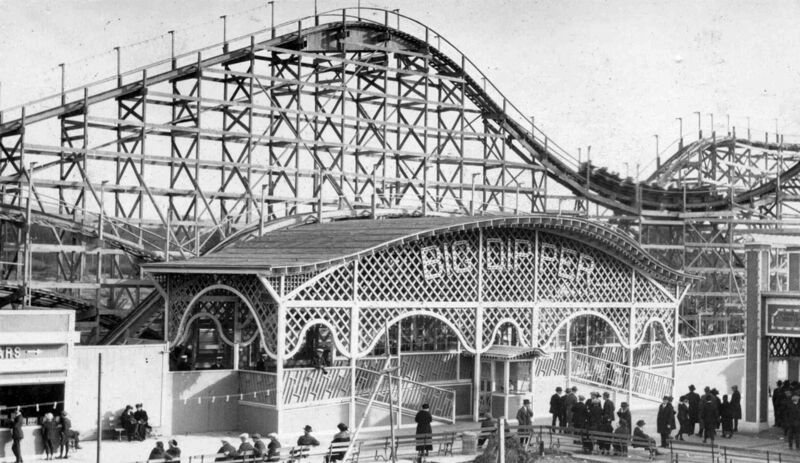 Like many coasters of the day, The Big Dipper roller coaster had no restraints, and riders were urged to hold on tight as it whirled around creaky turns in the thick ocean air. In 1945, a sailor on shore leave stood up at the wrong time, hit his head on a beam, and died later that afternoon. An urban legend grew around the incident, with the sailor’s head coming completely off and landing in a car full of park revelers who happened to be eating lunch. 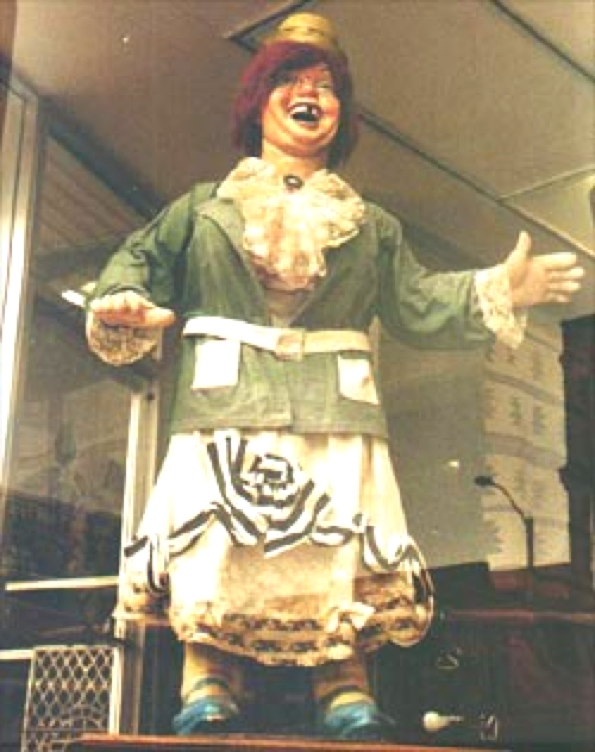 Laffing Sal was a large, matronly, animatronic woman that was placed in front of the Fun House in an effort to lure folks in. True to her name, she guffawed incessantly at visitors as they entered. Sal’s gaping mouth and continuous cackling unintentionally scared children. Coupled with screams from the roller coaster, she could be heard from several blocks away. 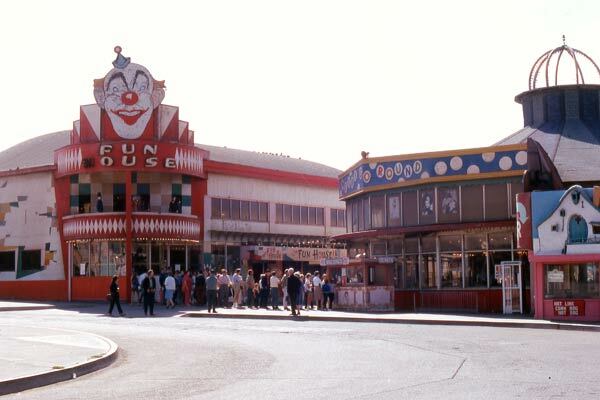 The Fun House was described as an amusement park within an amusement park. Fifteen cents would get you in. Once through the mirror maze, the fun- seeker would have to contend with the likes of the precarious Joy Wheel, moving bridges, shaky staircases and crazy catwalks. 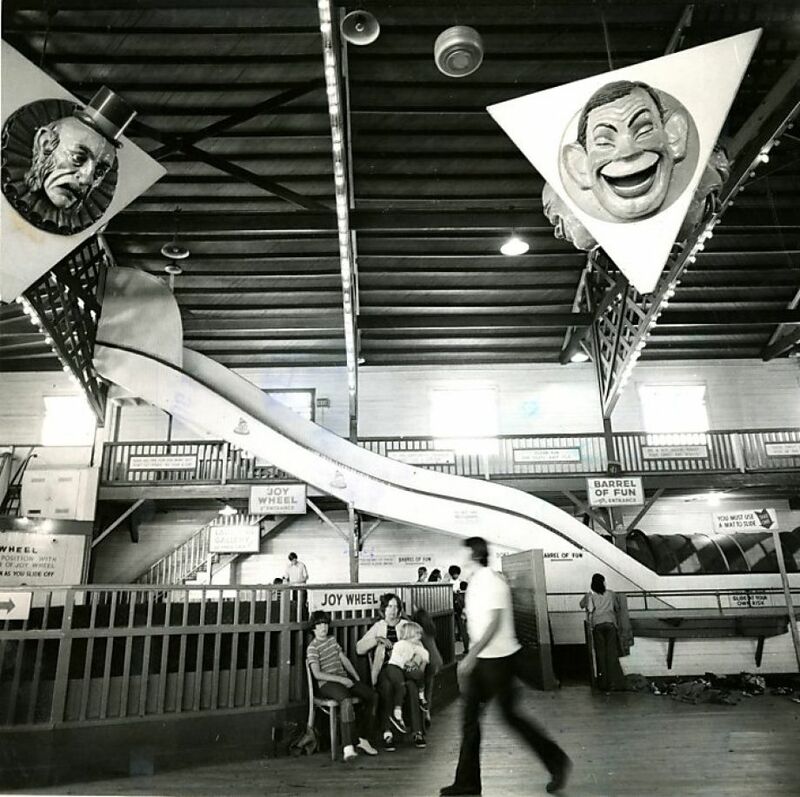 Throw in a 200-foot indoor slide, and the funhouse became the template for carnival horror flicks for the remainder of the 20th Century. Young boys would often line up near the air jets hoping for a salacious peek as unsuspecting women would walk through and have their skirts blown up around their head. The marine layer on Great Highway is usually thick with a gray, noir fog most of the year, creating a forbidding atmosphere that was perfect for popular spook rides that stayed open until midnight every day of the year. Attractions like Limbo and Dark Mystery thrilled park goers, who were swept away in carts through surrealistic facades around twisting, nightmarish turns as creepy plywood characters did what they could to scare them. 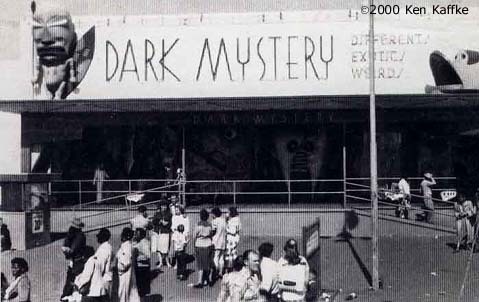 Dark Mystery originally had an African theme, but was changed to a more surreal theme in the 1950s. 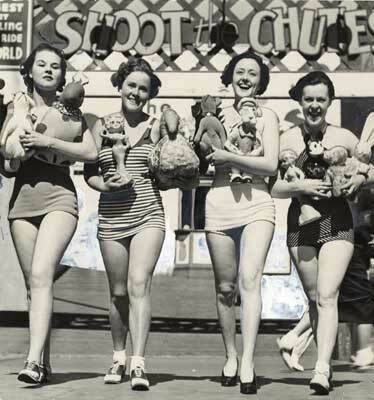 Spook rides became a staple of 1940s-50s carny America. 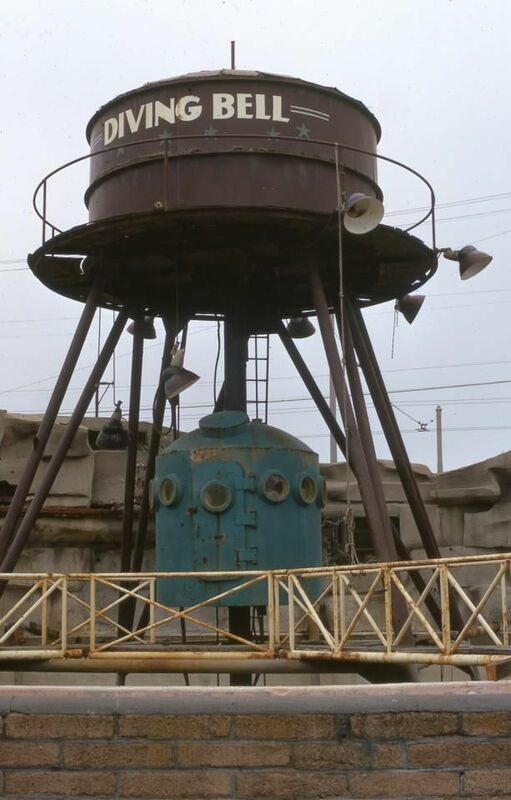 Originally designed for the 1929 Worlds Fair, the Diving Bell was a bizarre attraction. Several riders were sealed in a watertight chamber and lowered down a cylinder that stopped in a large tank. Through algae-clouded windows, the participant would observe whatever happened to be thriving in the murky water, which was usually just floating garbage with the occasional fish, just to keep things real. The inside of the chamber was dank, rusty and leaky, which made for an edgy experience. Once suitably claustrophobic, the unsuspecting participant would then be abruptly shot skyward, propelled by the water pressure, finally settling above ground after a dramatic splash. The ride promised fun, but many found the experience terrifying. In the early 1950s, Walt Disney made contact with several owners of seaside amusement parks to pick their brains about what made the parks operate successfully. Later on, George Whitney went to work for Disney and convinced him not to use live animals on the Jungle Cruise, which led to Disneyland’s first experiments with animatronics. 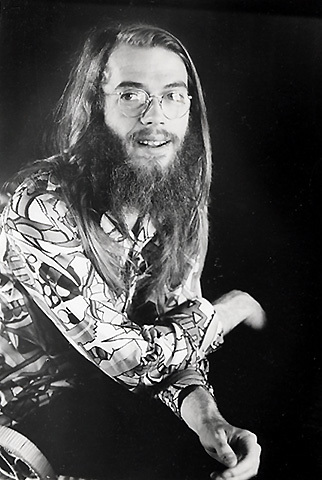 Chet Helms was a beloved countercultural icon who organized events at Golden Gate Park during the halcyon days of the flower power 1960s, and produced the first light shows at the legendary Avalon Ballroom. He was one of the main pioneers of the hippie movement. Under the name Family Dog, Helms organized dances and light shows with live entertainment from the happening bands of the day. 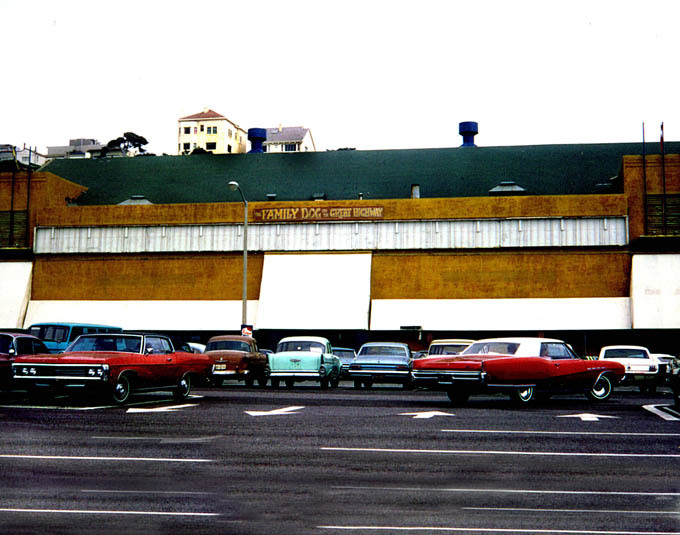 In 1969, Helms took over a building on the northern end of Playland that many San Franciscans knew as Topsy’s Fried Chicken, or the Slotcar Raceway. He called it The Family Dog. Opening night was June 13, 1969, and featured the Jefferson Airplane. For the next year of the Family Dog’s existence, music lovers would head out to the Great Highway, gyrate to the likes of the Grateful Dead, then stumble down in the cool ocean air and have a smoke with their toes in the sand. By 1955, the luster of Playland at the Beach began to tarnish. Despite its rigid construction, some were now viewing the Big Dipper as a wooden death trap, but most locals still loved it. Sadly, for reasons known only to George Whitney, the Big Dipper was torn down. The ride was replaced with a smaller coaster called the Alpine Racer, but it failed to recapture the magic of the Dipper. 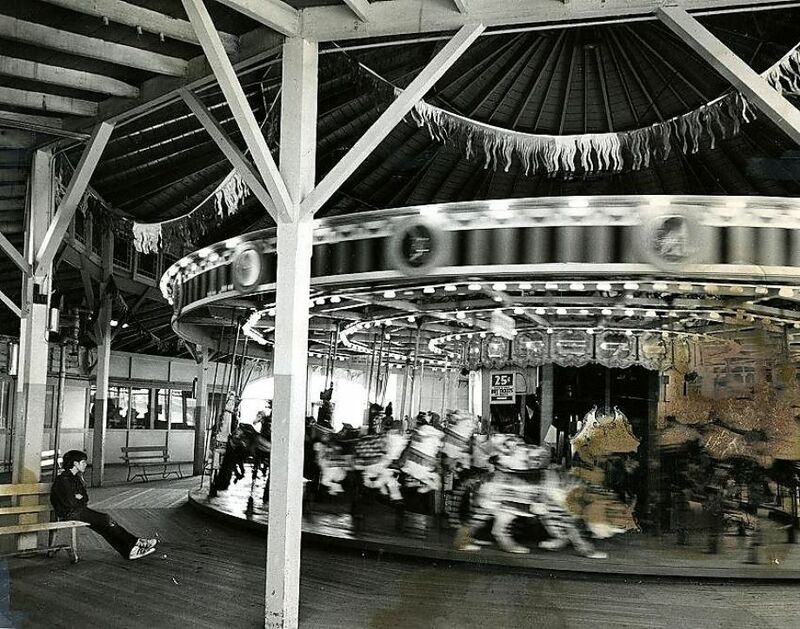 The people who worked on the midway during this time thought that the removal of the Big Dipper was the first nail in the coffin for Playland. In 1958, George Whitney died. George Jr. ran Playland for a while, but eventually sold it. The cost of keeping the park open was high, and the magic was gone. The late 1960s and early 1970s saw a shift in the zeitgeist of the San Francisco youth movement, as hippie idealism and peace and love gave way to speed, heroin, and violence. Two teens were killed in a fight at nearby Skateland, which resulted in Playland being viewed by many as dangerous and uncool. The hip kids had better things to do, and adults got tired of looking over their shoulders and fearing for the safety of their children. The end was near. 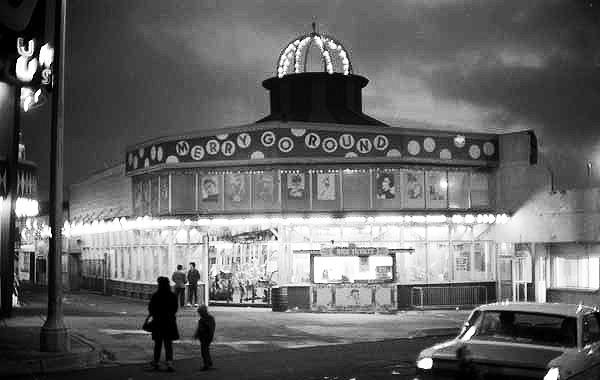 On September 4, 1972, Playland at the Beach was officially closed. It was demolished the following month. The land that Playland occupied became a sandpit, owned by millionaire developers to make way for the condominiums that remain there today. Where the Diving Bell once stood is now a crusty Safeway. Laffing Sal was shipped to Santa Cruz Beach Boardwalk. 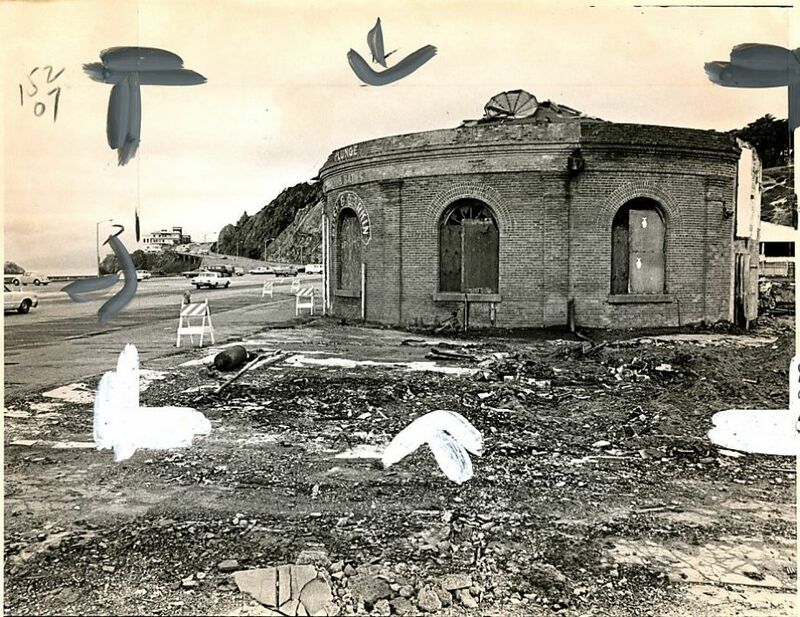 The city of San Francisco wanted people to forget about Playland. 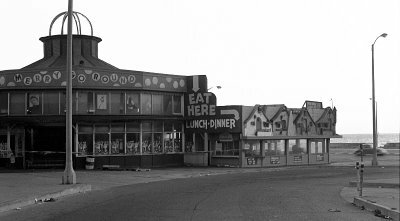 The only attraction from the days of Playland at the Beach that remains on Great Highway is the Camera Obscura, which is located next to the Cliff House Restaurant. The Camera Obscura is an optical device that projects an image of its surroundings, in this case the Pacific Ocean, onto a large, flat surface using only sunlight. 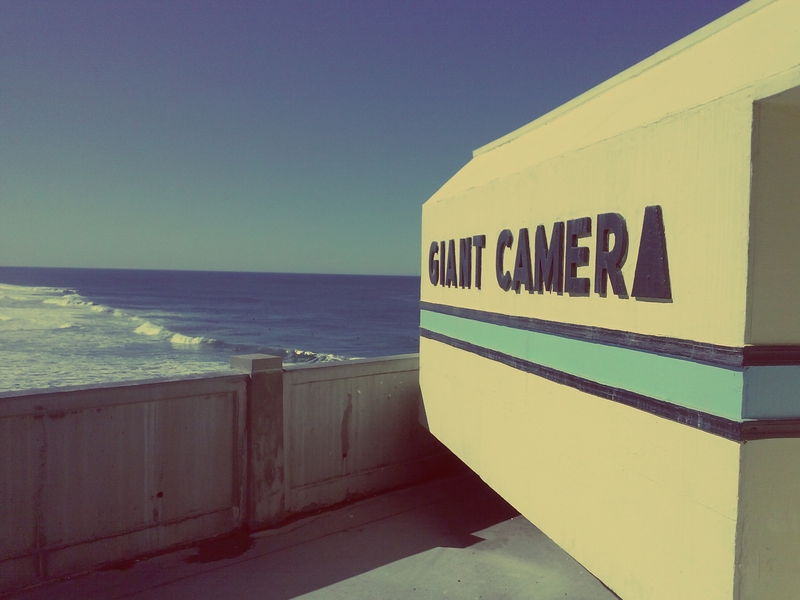 The Camera Obscura was placed next to the Cliff House in 1946, and has remained in continuous operation to this day. The arcade games from the midway, as well as an original Laffing Sal (there are several) can be found at Musee Mecanique, which lies at the foot of Taylor Street at Pier 45. Admission is always free, and Musee Mecanique boasts “one of the world’s largest (over 200) privately owned collection of coin operated mechanical musical instruments and antique arcade machines in their original working condition.” As a local who rarely goes to the tourist-ridden Fisherman’s Wharf, I highly recommend having a look at Musee Mecanique. If you want to get a feel of Playland, or just talk with some friendly, qualified folks who can answer all your Playland-related questions, check out Playland-Not-at-the-Beach in El Cerrito. Owners describe the space as a “temperature-controlled 9,000-square foot building chock-full of amazing things to see and do. There are 30+ pinball machines set on free play, arcade games, videogames, carnival games of skill where you can win prizes, penny arcades full of antique amusement devices, live magic shows, an amazing hand-carved miniature circus, side show acts, miniature dioramas, fascination games, and historic exhibits with artifacts from the Sutro Baths and Whitney’s Playland in San Francisco.” It’s definitely worth a trip to El Cerrito. Down the Peninsula in Burlingame sits the It’s-It ice-cream factory. The yummy ice cream cookie sandwich was created by George Whitney, and was first served at Playland. They don’t do tours, but Its-It cookie sandwiches are easy to find in grocery stores all over California. 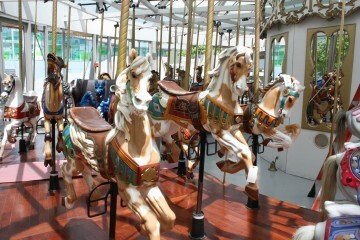 The original Looff carousel can be found beautifully restored south of Market at Yerba Buena Gardens. I recommend learning a little more about Playland, then head on up to the top of Sutro Heights Park, preferably at night, and look out over the plot of land that Playland once occupied. As corny as it may seem, use your imagination, and with the ocean wind blowing in your face, listen for Laffing Sal, the Fun House, and the screams and smells of Playland at the Beach.